Big lure, big results! 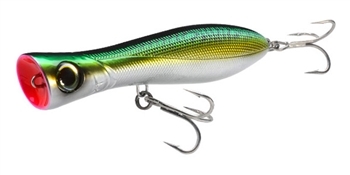 This lure is big and durable enough to tackle the toughest predators. Excellent for long casts with outstanding surface action. If you are serious about hooking the really big ones, then this plug may be No. 1 on your list. 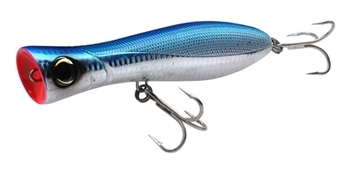 Yo-Zuri Bull Pop - Chrome Sardine 6"
Yo-Zuri is proud to announce the introduction of the new and improved Bull Popper. The Bull Popper has been redesigned with added features and a lower price point. 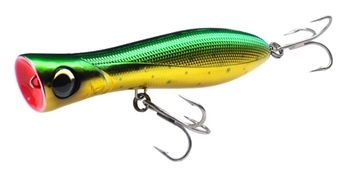 This versatile popper comes in two sizes and ten color patterns to cover a variety of inshore and offshore fishing applications. 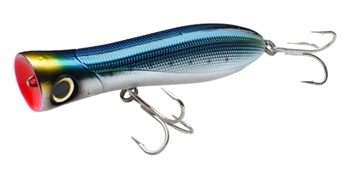 Yo-Zuri Bull Pop - Chrome Sardine 8"
Yo-Zuri Bull Pop - Dorado 6"
Yo-Zuri Bull Pop - Dorado 8"
Yo-Zuri Bull Pop - Ghost Black 6"
Yo-Zuri Bull Pop - Ghost Black 8"
Yo-Zuri Bull Pop - Holographic Blue 6"
Yo-Zuri Bull Pop - Mackerel 6"
Yo-Zuri Bull Pop - Mackerel 8"